Fantastic house in a fantastic location in the Hermosa Valley. Right between town and Purgatory Ski Resort, just down the road from Trimble Hot Springs. One road to town and one road to ski resort. This 3 bedroom 2 bath house is up against the west side cliffs of Hermosa valley. With beautiful views looking east across the valley. Master bedroom has private bath and access to deck for morning coffee or a bit of yoga before you start your day. 2nd bedroom with a double bed as well. 3rd bedroom features 2 bunk beds and play room for the kids to "hang out" in. 2nd full bathroom is located between 2nd bedroom and kids room. Living room and dining area are set up as one large room with kitchen attached with bar seating for a very comfortable and relaxed setting to enjoy a family meal, and family/friends time together. Large screen television as well to enjoy a game or movie with beautiful gas fireplace as well for a relaxing night at home. Right off kitchen is large deck with grill to enjoy the beautiful outdoor living we are afforded here in the valley. Modern kitchen has everything you will need to cook a full meal for your family and friends or to throw together a lunch to bring on a hike up into the mountains. Property comes full stocked with laundry service and everything you will need to enjoy your stay. PLEASE INQUIRE ABOUT DISCOUNTS I PERSONALLY CAN OFFER AT BUBBA'S BOARDS & CLIFFSIDE SKI. LOCATION, LOCATION, LOCATION. In my opinion nothing compares to the Hermosa valley. After a day in town it is so nice to come on out to the valley to get away from the downtown scene and after a day on the slopes or in the mountains to recharge your batteries in the valley. Full bathroom located between 2nd bedroom and 3rd bedroom. Property is tucked away in Hermosa valley. Between town and ski resort. Beautiful location and views!! Fully stocked kitchen providing all you will need for your cooking needs. Please inquire about discounts on snowboard and ski rentals. Dalton Ranch Golf Club is located just 2 miles away. Incredible golf course in the Hermosa Valley along the Animas River. T-times recommended. Wonderful home in a wonderful location!! Halfway between downtown Durango and ski resort. Walking distance to hot springs. Updated kitchen and carpets. Wonderful space upstairs for kids and large master with great view and large bathroom and closet. Lots of extras included. Soft towels and sheets, 2 big screen TV’s, great deck and cool floor plan. Owner very responsive to questions about property, easy to work with and very accommodating with anything needed. We would love to stay here again! Very easily fit our family of 8! Beautiful property! Would definitely recommend! This property was beautiful and had everything we needed for our family Christmas vacation! And the owner was very nice and easy to work with. Great experience! Hermosa is a great place to launch hiking trips into the San Juan’s. Trimble nice at end of the day. Fantastic home in the mountains. Loved this property!!!! The inside was beautiful, fantastically furnished from bedding, towels, kitchen furnishing, televison and sound systems, laundry facilities as well as being very beautifully decorated. We loved the spaciousness. Acessibility and proximity to Durango and area activities were the best......in the mountains, yet close to everything. We would love to stay here for weeks! Really enjoyed staying in the cabin, was very spacious. Close to lots of fun things to do. Could use some new mattresses. Beautiful well maintained property. Bright and spacious. A lovely property in well situated location. I highly recommend this property! Thank you so much for the kind words. We strive hard to keep our property in excellent condition and to provide our guests with great memories. Property is just minutes from Trimble Hot Springs. Perfect spot to relax with family. Dalton Ranch Gold Course is a quick 5 minute drive. Only 10 minutes to Historic Downtown Durango and 20 minutes to Durango Mountain Resort. 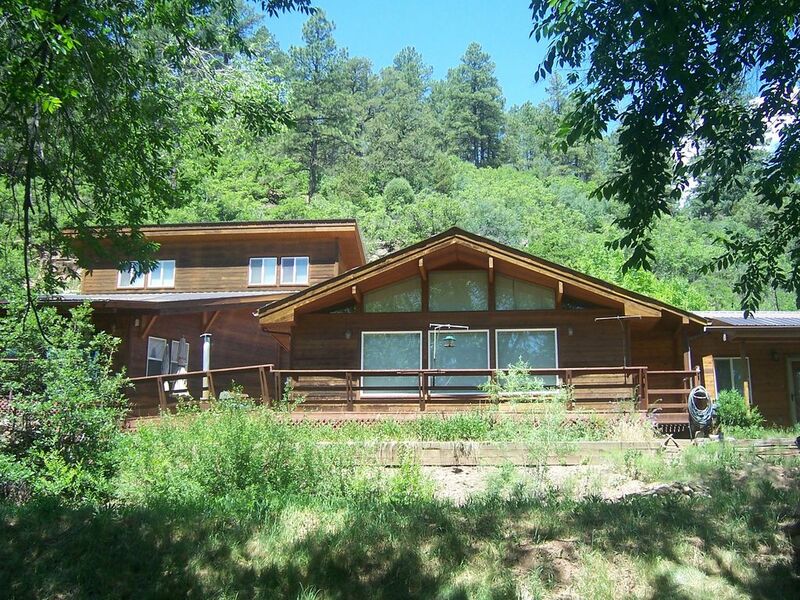 Perfect location to head north into the mountains south into town for all Durango has to offer! A separate cleaning fee of $200.00 is required and will be added to total rent due.